With these new tablets, Wacom has simplified its consumer-level offerings—formerly five tablets under the Bamboo name with varying price points and features—into just three devices, the Bamboo Connect, Capture, and Create. For this revision, the company has attempted to target a specific swath of the tablet market for each model, rather than promote them by features alone. The $80 Bamboo Connect, Wacom’s entry-level tablet, is designed for business illustration and simple doodles. Clad in black with a bright green accent, the device features a 5.8-inch-by-3.6-inch work area and 1024 levels of pressure awareness using one of the company’s signature pens with programmable side-buttons. 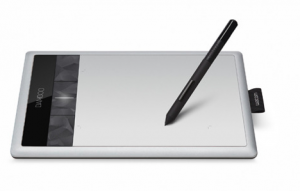 Users can connect the tablet to their laptop or desktop via USB, and have the option of working with it using included software like Autodesk’s Sketchbook Express, digital inking functionality within Microsoft Office, or any other installed illustration application. The mid-level consumer offering, the $100 Bamboo Capture, offers the same surface area as the Connect; with this silver-and-black tablet, however, users will get the ability to use multitouch gestures (up to 16 discrete touch points, and full support for gestures in Mac OS X Lion); and optional wireless connectivity (using a $39 accessory). By including a full version of Photoshop Elements in addition to Sketchbook Express, it looks like Wacom hopes to market the Capture toward photographers, though budding illustrators should also enjoy the device’s capabilities. On the high end of the spectrum, the $200 Bambo Create is solidly an artist’s tool: The tablet provides a full 8.5 inches by 5.4 inches of pressure-sensitive pen and multitouch workspace (in comparison to the Connect and Capture’s 5.8 inches by 3.6 inches), adds a pressure-sensitive eraser to the end of the stylus, and ships with Corel’s Painter Essentials along with Photoshop Elements and Sketchbook Express. And, like the Capture, users can enable wireless connectivity using Wacom’s $39 Plug-n-Play Wireless module. With the features it offers, the Create looks like it could fill a crucial niche for artists-in-training who can’t yet shell out $399 for a wireless Intuos4 tablet. You can pick up one of the tablets from Wacom’s website, or from one of the company’s authorized resellers. All three tablets support both Mac and Windows operating systems; users can download the correct driver from Wacom’s website.